Carlton Town 3-3 Stamford FC -- UniBond Division 1 South ..
Our scheduled game was Calverton MW v Southwell City in the CML Supreme division. We visited Hollinwood Lane last season and got thoroughly drenched, this year it was fog that caused us problems. The car park was packed solid, so we had to park a little way down the road from the ground - walking back we noticed how errie the back-lit trees looked in the fog -- after 7 days of having the crap scared out of me by Yvette and the TV's Most Haunted team, the image would not have been out of place on that show !! 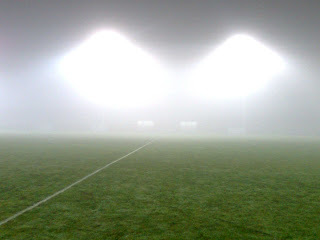 Paid our £3 to get in and with a blanket of fog covering the pitch we immediately wondered if the game was going to go ahead - but we were reassured when the Ref lead the teams onto the field of play and the game kicked off on time. To be honest we could only make out the individual players when they were in front of us, but we could see both goals from the halfway line and although not ideal, we were convinced the game would not be halted because of the conditions. How wrong can you be? 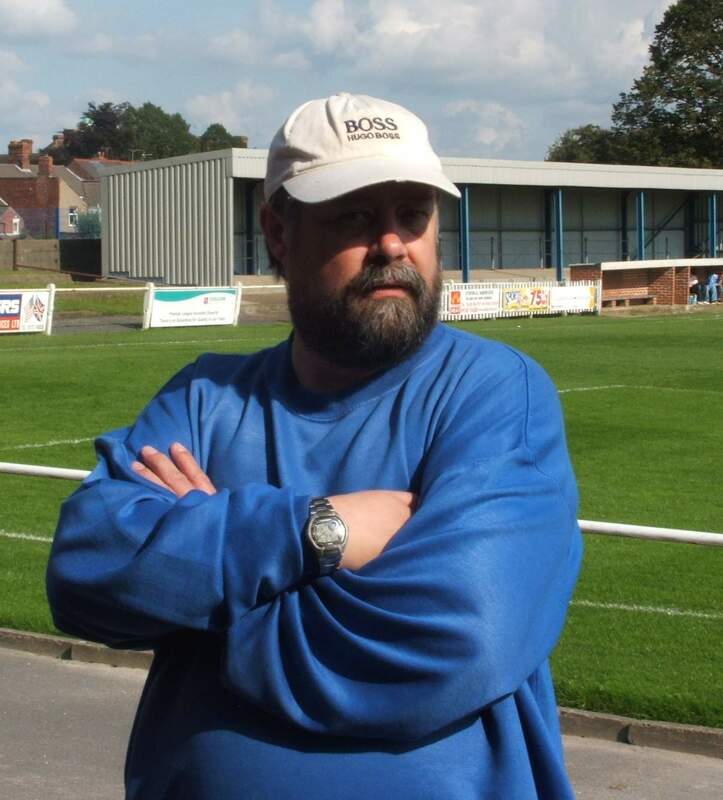 Southwell are managed by former Hucknall Town favourite, Mark Nangle and currently lie 13th in the table. 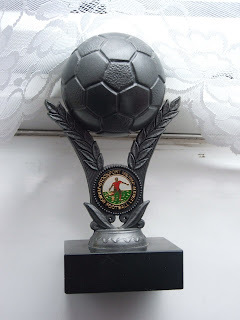 Victory would see Calverton go top. You would have thought it was the other way around as Southwell took the game to their hosts. 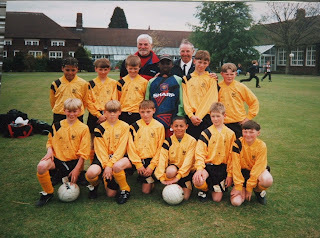 One of the players shouted “ come on lads – where are we?” – a valid question indeed !! Calverton keeper Lance Walker was by far the busiest player on the park, making five tremendous saves in the space of five minutes. On 14 he had to dive full length to push away a firece drive, then from the resultant corner he stretched well to tip over another effort. Two more blocks followed then in the 20th minute he somehow managed to block from point blank range when we all thought the goal was inevitable. We saw this ok from the halfway line, but the Ref and his assistants weren’t happy and after a short consultation decided that the game could not go on. A quick “ sorry lads, we tried” and off they went !! I know it was not ideal, but the conditions were no worse than when we kicked off and only the Ref can explain his decision. 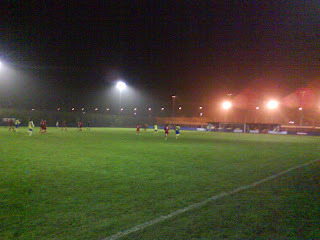 Anyway, thoughts then went to Carlton Town v Stamford. Plan B – but how to get to Carlton’s ground from Calverton? No problem – Kev had a think and off we went. A quick call to Evening Post Brian to find out if the game was on ( it was, and the score was 1-1), and after flying through Woodborough, Lowdham Grange and Burton Joyce, we arrived at the ground during the half time interval. Again we came across a full car-park, but Kev ALWAYS finds a space, although this time right next to a deep puddle that yours truly duly sploshed in to…..!! We sneaked into the ground to find Brian, who was shovelling pie and peas in his mouth like they were going out of fashion, and between mouthfuls told us that the half-time score was 2-2 ! It was great to hear that two of my YEFL rep squad lads from 1994-1997 had netted for Carlton – namely Dean Gent and Willis Francis .. quality players .. 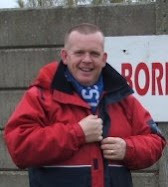 It transpired that Clarke had put Stamford ahead on 9, with Willis levelling four minutes later. Dean had added Carlton's second in the 38th minute with Stebbings scoring for Stamford right on the stroke of half-time. Stamford took the lead on 56. A neat ball down the left found Stebbings who ran at goal, shook off his marker and fired past Brealey in the Carlton net. Steve Chaplin restored parity three minutes later. A cross from Akers was nodded on by Smith and Chaplin’s deft header diverted the ball into goal. Attendance 102 + 2 !! Strange night, but enjoyed every minute!! Saturday – should be Eastwood v Brackley I suppose, but I did promise Fred that we would be visiting Kirkby Town – so if the game is on, he’d better get the best china out of storage ! !